Review: Based on a TV series. This is set in the early 1960’s About a CIA agent Napoleon Solo and a KGB operative who are sent on a secret mission to track down a criminal organization who are working to develop an advanced nuclear weapons programme. A film I was looking forward to but was really disappointed with by the end. I was expecting so much more from it. I felt that the only one that really tried to hold it together was Alicia Vikander and even she couldn’t save the film. It started off really good and quite entertaining and then it just lost its way a bit and didn’t really know what to do for the rest of the time. I loved seeing all the cities that they filmed in especially Rome. 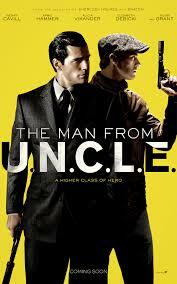 To prepare for this role Armie Hammer sat and watched the 1964 version of The Man from U.N.C.L.E. I did hear that Warner Bros. had been trying to adapt The Man from U.N.C.L.E. (1964) for over a decade. Actor George Clooney was originally cast as Napoleon Solo but had to drop out due to health problems. It’s o.k. to watch on a Friday night if there is nothing else on TV. It is a shame that Guy Richie has done such a bad job directing this as the Sherlock Holmes films were brilliant and just shows what a good job he can do.